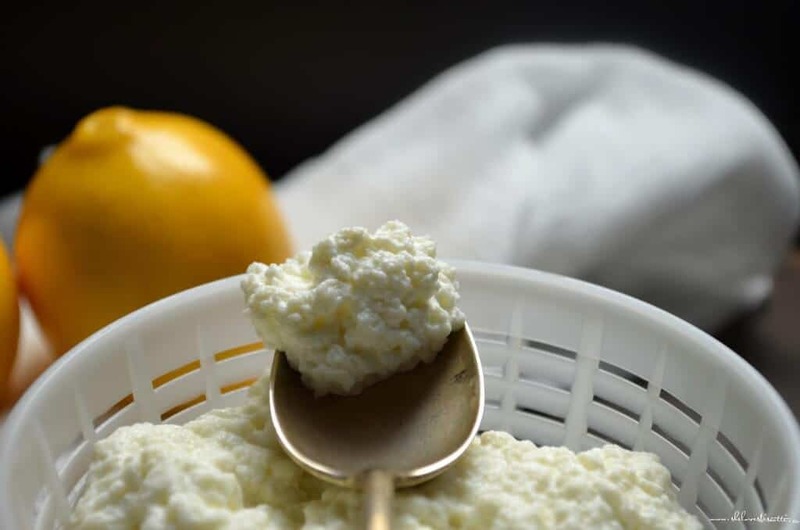 Home » How to » Homemade Ricotta Cheese: Only 3 Ingredients! This post was originally published on February 21, 2016 and republished on February 8, 2019 with updated content, photos and a video (located in the recipe card). Thanks for watching and sharing. Its creamy texture lends itself perfectly to sweet foods like cannoli, cheesecake or this Rice Ricotta Easter Pie. The taste and texture is equally appreciated in savory dishes, whether making Ricotta Gnocchi, used as a stuffing for cannelloni, or in a Tomato Ricotta Sauce for cavatelli. It is also great when making Italian appetizers. One of my favorite “quick” appetizer recipes to make with fresh ricotta are these Ricotta Stuffed Medjool Dates. 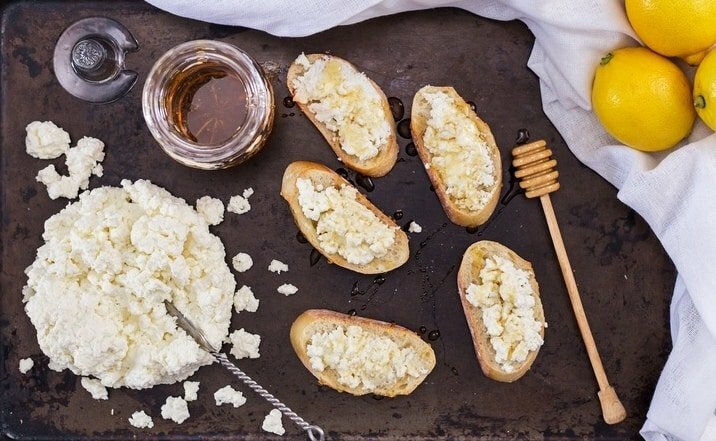 In just under one hour, and with only 3 ingredients, you can be spreading some creamy ricotta on a toasted baguette with a drizzle of honey. It’s easy, economical and tastes great! Life doesn’t get any better than this, my friends! So…are you ready to begin? What do I need to make Homemade Ricotta Cheese? Whole milk. Yes, full fat 3.25% milk. Salt. Adjust to your own personal taste. Lemon Juice. 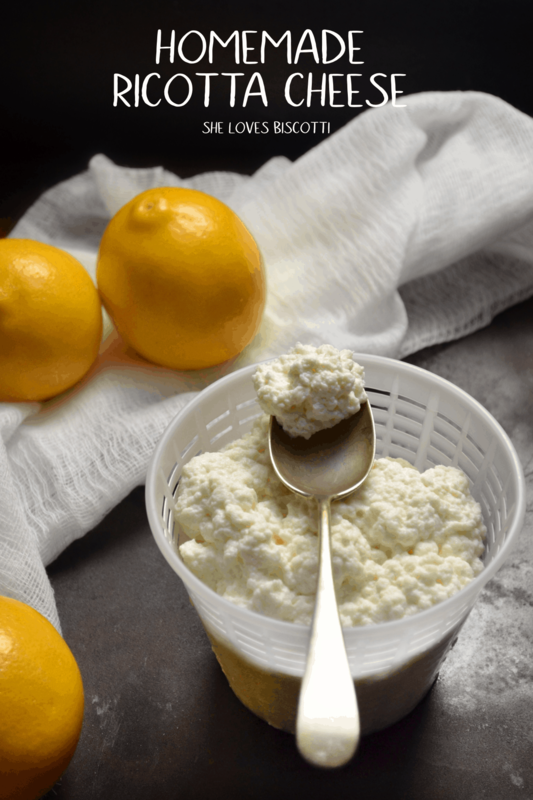 The acidity of the lemons will create those wonderful curds. As far as accessories are concerned, you need a heavy bottom saucepan with a lid, a wooden spoon, a slotted ladle, a bowl, and a strainer. You also need a cheesecloth and a ricotta basket. The objective is not to lose any of the curds when you drain your freshly made ricotta. I reuse the plastic containers from the times that I purchase store-bought ricotta. Begin by lining a large colander with a large piece of lightly dampened cheesecloth that has been folded over itself at least 3-4 times. Place the colander over a bowl. Make sure to use non-reactive materials. Alternatively, you can use a recycled ricotta basket. Set it aside while we begin to make the ricotta cheese from scratch. You are now ready to combine two of the ingredients (milk and salt) in a large heavy based saucepan. Please note you CANNOT make ricotta with ultra-pasteurized milk…so, no organic milk. 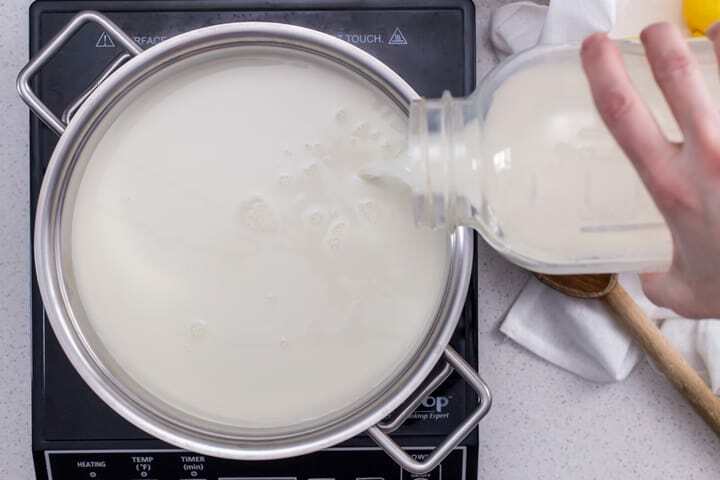 Over medium heat, heat the milk to 185°F (85°C), making sure to give the mixture an occasional stir with a wooden spoon. 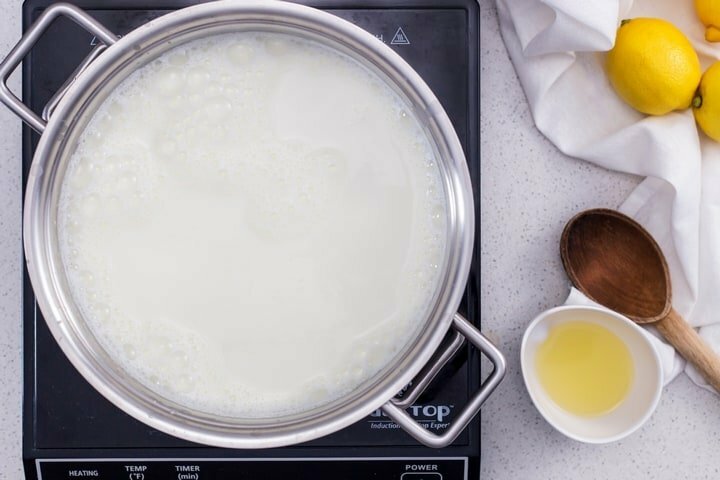 If you do not have a thermometer, heat the milk until it reaches a stage where there is a lot of steam, where little bubbles are forming close to the edge of the pot, and a slight film appears over the milk. It takes about 20 minutes to get to this stage at medium heat. Making ricotta requires a source of acidity in order for the curds to form. I usually use lemon juice or white vinegar. The results with the lemon juice can vary since it depends on the acidity of the lemon. Don’t hesitate to add an additional tablespoon or two of lemon juice if your milk does not curdle immediately. Do not use Meyer lemons as these are sweeter and do not have the same acidity as regular lemons. 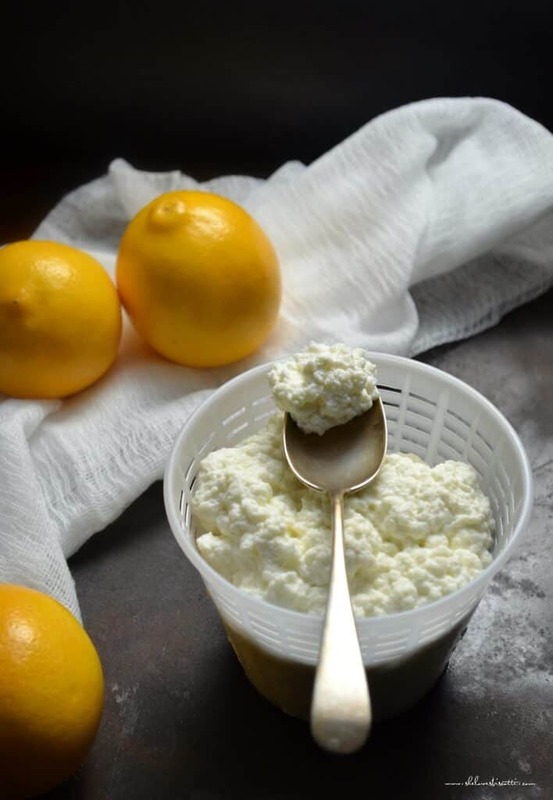 Lemon juice is definitely my preference when making sweet recipes using ricotta cheese. Here are some examples: Easy Lemon Ricotta Pancakes, Italian Sweet Ricotta Easter Pie, or even this Rice Ricotta Easter Pie. Can you tell I just love ricotta! I use white vinegar to make ricotta for savory dishes like a pizza, lasagna, pastas, or these Spinach Calzones. Reduce the heat to low and add your source of acid (I used lemon juice). You will notice that the mixture will immediately begin to curdle…continue to gently stir the mixture about for 2 minutes. 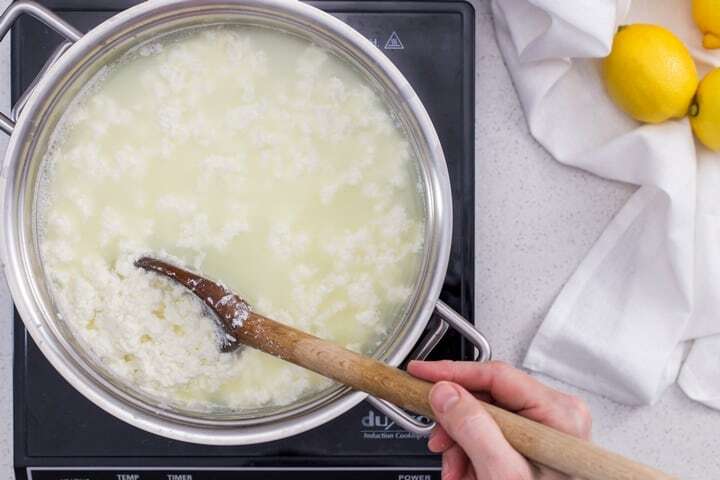 Isn’t it amazing that in just a few minutes, you will begin to notice the formation of curds? Carefully remove your soon-to-be creamy homemade fresh ricotta cheese from the heat. Let it stand, covered for about 20 minutes. Carefully ladle your ricotta into the cheesecloth lined colander or your basket. Your bowl will be filled with a liquid, which, as you know, is the whey. Since we are talking about whey, I would like to clarify that true ricotta is made from the leftover whey of cheese production. Hence the name “ricotta”, which literally means “recooked”. At this point you have a decision to make. The consistency of the final product will depend on the amount of time you leave the mixture to drain. If using the ricotta cheese to make a cheesecake or stuffed pasta, you need a firmer consistency – therefore allow to drain for at least 20 minutes. If you are using it as a spread (for example on a baguette), 3-5 minutes is more than enough time to obtain that creamy consistency. As a personal preference, you can replace 1-2 cups of the full fat milk with cream. This will create an even creamier ricotta. What will you make with this homemade ricotta recipe? The lemon juice can be replaced with an equal amount of white vinegar. Reduce the draining time for a creamier consistency. Homemade ricotta cannot be made with ultra-pasteurized milk…so, no organic milk. Use fresh ricotta immediately or can be refrigerated, covered for up to 3 days. 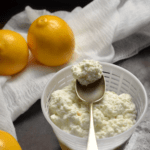 Can I use Meyer lemons to make homemade ricotta? No, since this variety of lemons does not have the same level as acidity as regular lemons. What is whey? Whey is the liquid that is formed following the addition of the lemon juice and after straining the curds. What can I make with whey? The leftover whey is great to use when making bread, pizza, pasta or even in soups. Can this ricotta be frozen? Yes. During my youth, most Italian families made their own wine, their own sausages, cheese, prosciutto, tomato sauce, pickled vegetables, jams, jellies, pasta, bread…I could go on, but you get my point. Imagine my surprise when I realized not everyone had homemade sopressata hanging in their cold room! I realize now what a privilege it was to have been exposed to so much passion when it came to food. When I think back to my grand-parents and my parents (and to a whole generation of immigrants), I am always impressed by how food helped preserve their identity. The philosophy is easy -enjoy and share food with family and friends. I hope you enjoy this ricotta in your favorite meals with your loved ones. 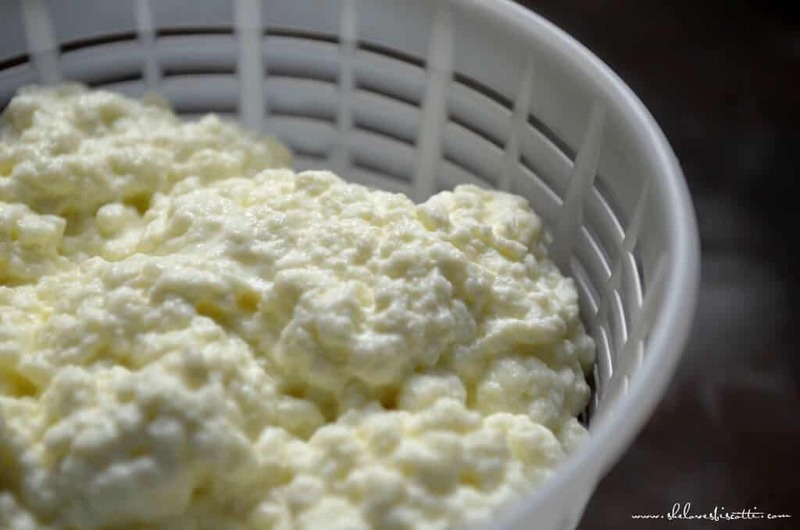 ★★★★★ If you have made this Homemade Ricotta Cheese recipe, I would love to hear about it in the comments below and be sure to rate the recipe! 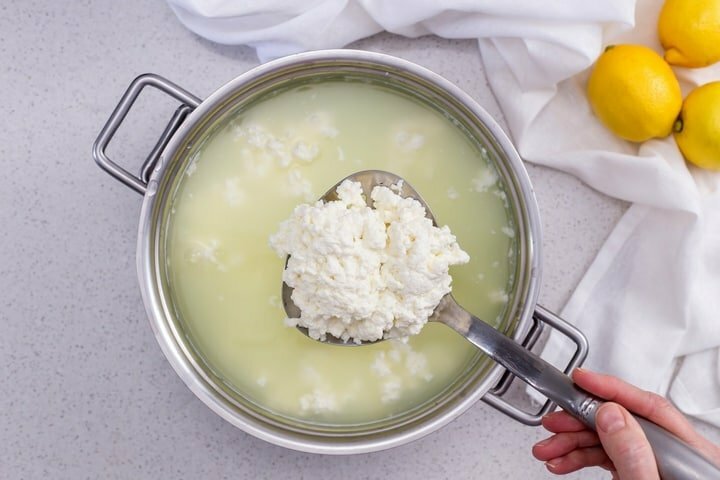 With just 3 ingredients, you can make this creamy homemade fresh ricotta cheese. It's easy, economical and tastes great! Line a colander with a large piece of lightly dampened cheesecloth that has been folded over itself at least 3-4 times. Place the colander over a bowl. Make sure to use non-reactive materials. (Alternatively, you can use a recycled ricotta basket placed on a bowl). In a large heavy based saucepan, over medium heat, heat the milk. Add the salt and stir occasionally with a wooden spoon. Make sure the milk does not scorch. 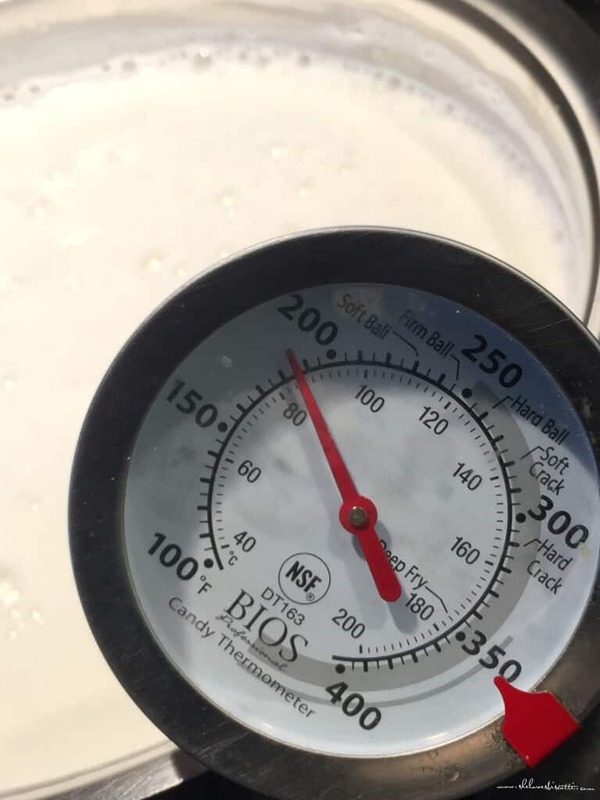 If you have a thermometer, heat to 185 F. If you do not have a thermometer, you need to reach a stage where there is a lot of steam, little bubbles close to the edge of the pot and the formation of a slight film. It should take about 20 minutes to get to this stage. Add the lemon juice (or vinegar). Slowly agitate the mixture for 2 minutes. You will notice the curds (the ricotta) separating from the whey (yellowish liquid). Cover pot and let stand for about 20 minutes. Carefully “ladle” your ricotta into the cheesecloth lined colander or your basket. The consistency of the final product will depend on the amount of time you leave the ricotta to drain. 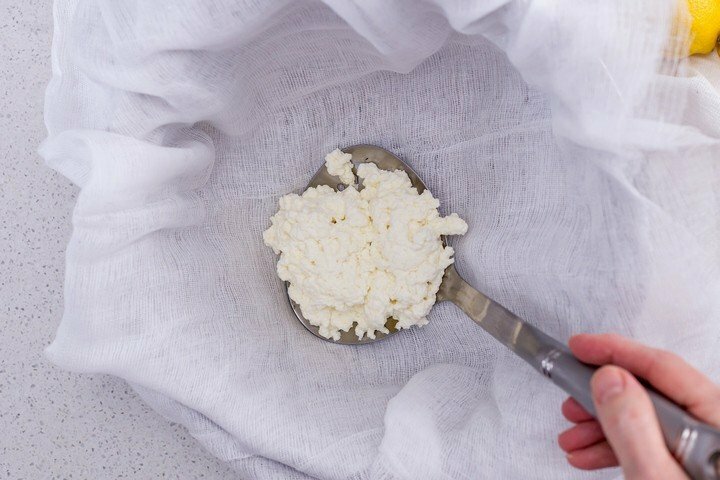 For a creamy ricotta, let it sit for 3-5 minutes; for a dryer ricotta, it can sit up to 20 minutes. Use immediately. Cover and refrigerate any leftovers. Homemade ricotta cannot be made with ultra-pasteurized milk...so, no organic milk. Yield is about 2 cups or 200 grams. Very good and so easy to make. Family is enjoying a mango cheesecake made with cheese. And I will be making bread with my machine next. Would like some ideas to use all this whey. Hate to waste. Thrilled to hear you are enjoying the ricotta June… the cheesecake sounds delicious! I will use the whey to make bread or homemade pasta. I also use the whey when cooking rice. Thanks so much for taking the time to comment, appreciate it. Just discovered your site. WONDERFUL. My Dad is on a low sodium diet. Would I be able to skip the salt in the homemade ricotta? Thanks so much for all the exceptional detail in your recipes. Thank you for your kind words Carol. Yes, the salt is added for flavor. Great comment. Thank you. Hi! Can lime juice be used instead of lemon? Thanks! That is a great question Judy. I have never tried to make ricotta with lime juice. Based on their similar properties, it should work but I think the taste will be off, so I would not recommend it. Thanks Karyl. Yes, it really is that easy and you can actually taste the difference of homemade ricotta cheese! Enjoy! Thanks for stopping by. I don’t know if making this recipe was a good thing to do. It comes so good that now my son keeps bringing me milk to make his family cheese. Of course I love to do it. We have a source of clean, fresh , raw Jersey milk. I make sure the temperature it high enough to be safe. Oh my it is wonderful. Thanks again. I could give you 10 stars. Nice! I Make Ricotta all the time but use milk and heavy cream method. I have never tried just all milk but I will try your method this week, it looks great . I’m sorry, but this didn’t work out. I followed instructions, and 90% of it was still milk. I am sorry to hear it did not work out Isaac. I am curious to know did you use lemon juice or vinegar? Just discovered your website today and needless to say I am totally hooked!! Love your baked goods and the homemade ricotta is one I definitely need to try asap!! Thank you Maria for sharing your heritage and love per il cibo Italiano! !